Ace Balustrades Limited are based near Telford in Shropshire allowing easy access to all major motorway networks throughout the U.K.
Our office team and workforce are all highly qualified in their individual skills. Each contract is taken on with care and attention to detail to ensure projects are delivered on time and to the total satisfaction of our Clients. Contracts are undertaken from Single Balconies through to multi story high rise blocks, along with all associated products. In addition to new build projects, we also undertake refurbishment work to suit client requirements. No matter what the size of the project we have the workforce that can get the job done in a speedy cost effective manner. 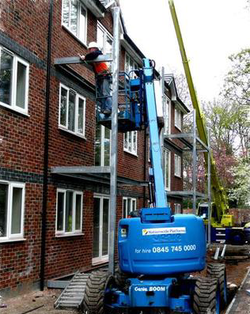 Ace Balustrades Limited Erectors are CITB accredited & hold valid CSCS cards. All work is undertaken in accordance with our Method Statements and Risk Assessments which are all job specific, thus ensuring our excellent safety record is maintained. Our team is professional and flexible having the knowledge and expertise to solve operational problems that may occur onsite, often involving complicated work in very demanding site conditions.